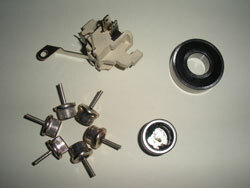 All the common parts you will need for a rebuild while underway: Brushes, bearings, and replacement heavy duty diodes. Since brushes and bearings are the normally wearing parts of an alternator, having these spares on hand allows you to fix problems fast, wherever your travels may take you. We offer the Powermax basic regulator as a spare or replacement part, both with & without a wiring harness. Our 12" Universal Tensioner Arm provides greater flexibility for attachment in non-standard installations. The arm can easily be cut and re-drilled to acommodate many needs. When upgrading to a PowerMax High-Output Alternator, you must be sure to replace your output and ground cables to heavier gauge cable capable of handling higher amperage. Our investment in the proper tooling allows us to quickly make professional quality cables for your PowerMax Alternator. Call us & provide us with the gauge of the cables you need along with the lengths, and we'll promptly build them for you. We also offer a number of replacement Powermax alternator parts to make certain that your Powermax will always be performing to its full potential. You'll find many of the popular Powermax replacement parts listed below. The Spike Stop protects the alternator diodes or the alternator regulator from damaging voltage spikes when someone accidentally turns the selector switch "off" while the engine is running. The Spike Stop is also very effective against lightning and transient voltage spikes. Think of the Spike Stop as cheap insurance to protect an expensive alternator or regulator & you'll instantly justify its minimal cost! Easy hookup - The Spike Stop simply "hangs " on the output and ground stud on the back of the alternator.